NEW ORLEANS – Minnesota State’s Katelin Rains, Saint Augustine’s Joe Kindred and head coach George Williams are among the 48 recipients of the NCAA Division II Regional Athlete and Coach of the Year honors for the 2009 indoor track and field season, the U.S. Track & Field and Cross Country Coaches Association announced Monday. Rains, a senior from Spring Lake Park, Minn., will look to continue her impressive run at the NCAA Championships as she goes for her third straight NCAA Division II title in the women’s pole vault. Rains is also the current NCAA Division II Indoor meet record holder clearing 4.31m (14’1.25”) at last year’s championships and has already bettered that mark this season with a clearance of 4.40m (14’5.25”). Kindred, a senior, is one of the best jumpers in Division II as he is ranked at or near the top in three individual events for the NCAA Division II Indoor Track and Field National Championships. Kindred has the top long jump mark, the second-best high jump, and the third-best triple jump. He is the defending champion in the high jump and was runner-up in the long jump at last year’s NCAA Championships. The 2009 NCAA Division II Indoor Track and Field National Championships will take place on March 13th through March 14th in Houston, Texas as part of the NCAA’s Division II Championships Festival. Williams comes off a dominating season as the defending national champion in the 60 meter hurdles. Continuing her excellence in the event, she registered the nation’s best mark this season, posting a time of 8.27 seconds. Williams is a sophomore from St. Andrews, Jamaica. Williams has the second fastest 400 meter qualifier this year (55.31) and is ranked 10th in the 200 meter dash (24.92). She ran the lead leg of the RMAC leading 4×400 meter relay team (3:53.55). The sophomore is from Colorado Springs, Colorado. Taylor is currently ranked sixth on the NCAA performance list in the 60 meter Hurdles (8.63). She was named the 2009 Northeast-10 Conference Indoor Track and Field Most Valuable Athlete, as she won the 55 meter hurdles. A 2009 All-New England selection in the 55 meter hurdles; she is a junior from Plainfield, New Jersey. A junior from Pontiac, Michigan, Wheat won the GLIAC Championship in both the 60 meter dash (7.67) and 60 meter hurdles (8.37), and was the anchor leg on the winning 4×400 meter relay team (3:55.42). Wheat has the second best 60 meter hurdle time in Division II this season (8.37), and is also a new school record. A senior from Columbia, South Carolina, Schandevel is ranked 31st in the women’s 5,000 meters on the NCAA Division II performance list (17:36.36). She also runs the 1200 leg on the DMR which has posted a time of 12:09.79. Saka scored an impressive 30.5 points at the Mid-America Intercollegiate Athletics Association Championship meet. She leads Division II in both the 200 meters (24.23) and 400 meters (53.34). The native of Istanbul, Turkey is a member of UNO’s 4×440 meter relay team which is ranked fourth in Division II. Zeferjahn is the first female track athlete in Queens history to qualify for the NCAA Division II Indoor National Championships. She is ranked 7th nationally in the women’s 5,000 meters with a time of 16:56.78, which is also a new Queens school record. She is a freshman from Hisperia, California. Puga was named the GNAC Outstanding Female Performer at the GNAC Indoor Championships, winning conference titles in both the 800-meters and mile. Both winning times (4:47.27 and 2:09.86) were new meet records. She has declared to the NCAA Division II Indoor Championships in two events, earning the second seed in the 800-meters (2:10.16) and as an integral part of the NNU Distance Medley Relay team. Braun is the NCAA leader in mile (4:03.85) and 2nd behind teammate Brian Medigovich in the 5000 (13:55.40). He also ran the mile on the NCAA-leading (9:49.94) and RMAC Champion DMR team. Braun is a junior from Fort Collins, Colorado. Sanca, a senior from Boston, Massachusetts, was named the 2009 Northeast-10 Indoor Track and Field Athlete of the Year. He holds the third-fastest 5000 meter time (14:07.26) and runs the mile on UMASS Lowell’s DMR squad which is ranked third nationally (9:57.70). He won the 3000 meters at the New England Championships and helped lead his DMR squad to the New England title as well. Isles, named the GLIAC Freshman of the Year, has qualified for the NCAA Division II Indoor Track and Field Championships in four events (60m, 200m, long jump, and 4×400 meter relay). He holds the Ashland school record in the 60 meter dash (6.74). Isles won the GLIAC title in the 60 meters (6.77) and was third in the 200 meters (21.79). A senior from Decatur, Georgia, Prince boasts the nation’s top time in the 200 meter dash, clocking in at 21.59 seconds. He also sits second nationally in the 400 meter dash (47.25) and runs on the 7th ranked 4×400 meter relay. Prince returns to the Indoor Championships this year looking to improve upon his 4th place finish in the 400 meters last season. A junior from Peoria, Arizona, Haynes qualified in two events for the Indoor Championships (60 and 200 meters). Haynes also took home the individual crown in the 200 meters at the MIAA Conference Championships. Haynes is the defending Division II national champion in the 200 meters, winning last year’s race in 21.78 seconds. Crouch is ranked sixth nationally in the 5,000 meters with a time of 14:17.34. He has run 7:57.79 in the 3,000 meters which is a new school record and is also 6th on the US Indoor List for 2009. He was the top collegian finisher in the men’s 3,000 at the USA Indoor Championships. Crouch is a sophomore from Yucca Valley, California. Zeke Van Patten, a sophomore from Corvallis, Oregon, earned an NCAA automatic qualifying standard in the men’s 800m with a time of 1:51.73 at the Seattle Pacific Last Chance Meet. He also earned an NCAA provisional standard in the mile with a time of 4:15.84. Van Patten helped lead the Western Oregon men’s track and field team to its second consecutive GNAC indoor championship as he notched 20 team points for the Wolves. Hendershot was the PSAC Champion in Pentathlon with a school record 3,505 points (14th in Division II). She is the current national leader in the high jump at 5-09.25 (1.76 meters), a height she cleared in competition on multiple occasions. Hendershot was named the PSAC Most Outstanding Field Athlete of the Championship meet. Rains, a senior from Spring Lake Park, Minnesota, qualified in three events for the NCAA Division II Indoor National Championships. She was also named the NSIC Field Athlete of the Year after winning both the pole vault and long jump with new conference records, and finished second in the triple jump at the conference meet. Rains holds the nation’s best pole vault (14’5.25") and is ranked fifth nationally in both the long (19’4.75") and triple jumps (39’0.25"). Mathelier broke the school pole vault record three times in 2009 and is currently ranked 13th nationally (12’3.5"). She was the 2009 Northeast-10 Conference Champion and finished fourth at the New England Championships. She is a senior from Freeport, New York. Cooper won the GLIAC Conference title in the 20 lb. weight throw tossing 19.97m (65’6.25"). For her efforts, Cooper was named the 2009 GLIAC Field Event Athlete of the Meet. Her sixty-five plus foot toss in the weight ranks first on the Division II national descending order list and is nearly three feet better than the next mark. Cooper is also ranked 6th in the shot put nationally (47’0.75"). She is a sophomore from Circleville, Ohio. Campbell has qualified for the NCAA Division II Indoor Track and Field Championships in three events (HJ, LJ, and Pentathlon). She has a best of 19’9.5" in the long jump and has cleared 5’7.75" in the high jump. Her long jump mark is ranked second nationally. She is ranked 12th in the pentathlon with 3,509 points. She is a senior from St. Charles, Missouri. Taylor is a 2009 provisional qualifier in the triple jump (37’9.25") at No. 21 nationally. She set the team record, won her event and provisionally qualified in her first collegiate triple jump this season. She also long jumped a season-best 17’7". She is a senior from Albany, Georgia. Tandle has thrown 53’9.75" in the weight, and she has thrown the shot 48’9.5". She won GNAC conference titles in both throwing events. Krissy is the national leader in the shot put.This year she became the first GNAC athlete to win four titles in a single event when she won the shot put at the conference meet. Kindred, a senior from Fuquay-Varina, North Carolina, is one of the top men’s jumpers heading into the NCAA Division II Championships. He is ranked first nationally in the long jump, second in the high jump and third in the triple jump. He was the high jump champion in the CIAA this year, and was the runner-up in both the long and triple jumps. A senior from Pueblo West, Colorado, Gersick qualified in two events for the Division II Indoor National Championships – the shot put and weight throw. He was also named to the All-Rocky Mountain Athletic Conference First Team in those same events. Currently, Gersick owns the nation’s fourth highest shot put mark this year (58’8.5”) and the sixth best distance in the weight throw (63’9”). A 2009 NCAA Division II Indoor Track and Field qualifier in pole vault (5.03m), ranked 11th nationally. Whitehead was named the 2009 Northeast-10 Conference Most Outstanding Performer, also setting a new Northeast-10 record in the pole vault at the conference meet. Whitehead is a junior from Darien, Connecticut. Roberts is the only shot putter in Division II with a toss over 60 feet this year. His mark (60’3.25") is the ranked first nationally. He has thrown 61′ in the weight throw which is ranked 11th in Division II. Roberts was the GLIAC Champion in the shot (58’5.25"). He is a sophomore from Lancaster, Ohio. Batson currently owns the 16th best national slot in the triple jump. He posted a mark of 48’1.25” at the East Tennessee State University Niswonger Invitational. Batson is a junior from Christ Church, Barbados. Frizzell sits second and sixth nationally in the weight throw (20.29m) and shot put (17.64m), respectively. He also won the MIAA individual title in both these events, posting a new conference record in the weight throw of 65′-11.5". Frizzell is a sophomore from Chillicothe, Missouri. Rolle is a 2009 provisional qualifier in the triple jump at No. 11 (48’6.25"). He won the Clemson Tiger Invite and finished second three times this indoor season in the triple jump. Rolle is a senior from Nassau, Bahamas. Brown set a new WWU school record in the pole vault at the GNAC championships (16’6") successfully defending his 2008 conference championship. His clearance was an automatic mark for the NCAA Division II Indoor Track and Field National Championships and is 12th on the descending order list. Brown is a sophomore from Bellingham, Washington. John Papa has guided The Rock to the previous three Pennsylvania State Athletic Conference Women’s Indoor Track & Field titles. Under Papa’s tutelage, Whitney Hendershot owns the strongest individual mark of the year in the high jump, clearing 5’9.25”. Papa is currently in his 22nd season at the helm of Slippery Rock. MSU’s head coach Jen Blue was named the NSIC Coach of the Year. Blue led the Mavericks to their first indoor conference title in the programs history. Blue is in her ninth season as head coach of the Minnesota State women’s cross country/track and field program. Covert guided the Owls to a second-place finish at the 2009 Northeast-10 Conference Championships. The Owls also posted the highest finish of any Division II school at this year’s New England Championships. This is Covert’s second season as head coach of the women’s program. Now in his tenth season, Baltes has led his Women’s Indoor Track teams to a stunning 10 consecutive Great Lakes Intercollegiate Athletic Conference titles. All told, Baltes has been named the conference’s Coach of the Year 21 times in his tenure across all three sports. The Lakers will look to improve upon their 6th place finish at last year’s Indoor Championships. Smith’s 2009 Kentucky State team provisionally qualified one individual for the NCAA Division II Indoor Track and Field National Championships. The team has been ranked in the top 25 of the USTFCCCA Division II Indoor Track and Field Dual Meet Rankings all season. Thomas takes 21 Blue Tiger qualifiers to this year’s Division II Championships, including Samoy Hackett, who is currently #1 in the nation in the 60 meter dash. Additionally, his 4×400 meter relay team sits atop the national rankings with a time of 3:47.08. Lincoln finished third at last year’s Indoor Championships. Mead’s Lakers set eight team records this season and had one provisional qualifier in Jon Taylor in the triple jump. Mead is in his 12th year as the Lakers head coach. Lerum guided the Falcon women to their sixth consecutive Great Northwest Athletic Conference indoor championship. Seattle Pacific posted 10 NCAA automatic marks and 14 provisional marks, which were achieved by nine different athletes and one relay. Williams has qualified 14 student-athletes for the Division II Indoor Track and Field National Championships in eight different events. Five of his athletes have qualified in two or more events as well. Saint Augustine’s has the top time/mark in three events on the performance list. Saint Augustine’s also won the 2009 CIAA Indoor Track and Field Conference championship. Schuck’s Mavericks qualified four individuals for the NCAA Division II Indoor Track and Field National Championships. Earlier this year he was named the NSIC Coach of the Year after he led his team to its 12th indoor title, and third in the last four years. This is Schuck’s 11th year as the head track and field coach at Minnesota State. Maloney guided the Owls to their seventh straight Northeast-10 Conference indoor title, earning Northeast-10 Men’s Indoor Track and Field Coach of the Year honors in the process. He will bring three individuals to the NCAA Division II Indoor Track and Field National Championships. Maloney is in his ninth year as head coach of the Southern Connecticut State Owls. Logan led the Eagles to their first men’s indoor conference title in nine years and was named the GLIAC Men’s Coach of the Year. He has nine individuals and one relay qualified for the NCAA Division II Indoor Track and Field National Championships. His athletes currently hold the top marks in the pole vault, shot put, and weight throw. This is Logan’s fourth year as the head track and field coach at Ashland. Guymon brings 3 athletes in 4 individual events to this year’s Division II Indoor Track & Field Championships. Daniel Kirwa, a sophomore on the Bison squad, qualified in both the mile run and the 5000 meters. Additionally, Guymon’s distance medley relay team is ranked 6th in the nation. Janvrin and Pedersen coached the Mules to their second consecutive MIAA Conference title and 10th in the last 12 years. 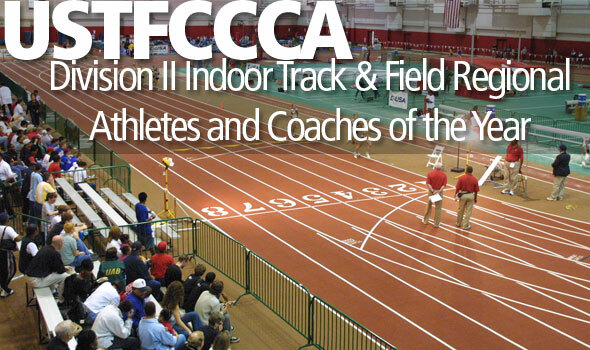 Central Missouri qualified eight student-athletes in five events for the Division II Indoor Track and Field National Championships, and they ranked fourth in the USTFCCCA Dual Meet Rankings. Janvrin and Pedersen are in their 12th season as co-head coaches at Central Missouri. Simmons has one auto qualifier in the men’s 5,000 meters and one provisional. One of his 5,000 meter runners is ranked sixth nationally (14:17.34). Coaches sophomore Michael Crouch who finished 11th at the USA Indoor Championships in the 3,000 with a new school record time (7:57.79). Also coached Devin Kelley to new Queens 800 meter school record (1:54.42). This is Simmons’ second year at Queens. Johnson coached Western Oregon to its second straight GNAC indoor championship and Zeke Van Patten to an NCAA automatic time (1:52.33) and Jeff Long to a provisional time (1:54.31) in the 800m. This is Johnson’s sixth year as the head cross country/track and field coach of the Wolves.